This weekend, Kim and I decided to go to Las Vegas. Floyd and Nitin were also there for The Serverside Symposium. 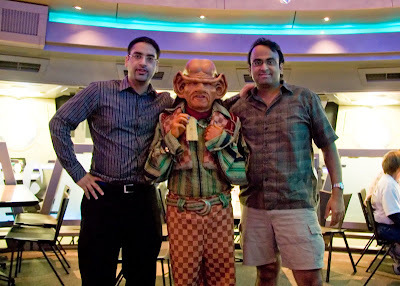 One of the days we got together and went to the Star Trek Experience at the Las Vegas Hilton. FYI, seems they have really jacked up their prices lately, so this will probably be the last time I'll be going there. Anyway, it was a fun weekend, and as usual we didn't have time to see and do everything. I have more pictures in the Las Vegas Gallery and more snapshots in the snapshots gallery. Since I had just sold my 20D, for the trip we decided to take only Kim's RebelXT and the 17-85 IS along with the 35mm f/2 prime. Naturally the IS was a boon for all the night shots. Even though the lens is fairly slow with IS and ISO 1600 we were able to get a lot of good shots. The 35mm f/2 came in really handy when we were inside the Shark Reef attraction at Mandalay Bay. Technical Specs: Canon 350D, 17-85 @ 17mm, f/4, 1/4s, ISO 1600.